While partisans and supporters consider New Jersey Governor Chris Christie to be a no-nonsense, frank-talking, don’t-mess-with-me breath of fresh air, his latest outburst–in which he ridiculed a reporter who challenged the sufficiency of one of his answers at a press conference (see the confrontation, here)–has us wondering about the genesis of Christie’s pugnacious, unfiltered verbal style. Whether suggesting that a journalist was “stupid” and an “idiot” (see the incident, here), or labeling a Democratic New Jersey state lawmaker “an arrogant S.O.B.” (see the story, here), or responding, “It’s none of your business,” when asked by a constituent to explain why the Governor sends his children to private school after cutting funding for public schools (see the video, here), Christie’s finger seems frequently to be squeezed just a tad tightly against the trigger of a verbal blast. So what gives? What is it about this potential 2016 Republican Presidential candidate that has him so ready, at the slightest provocation, to respond with such unmeasured biliousness? For answers, we turned to the noted psychoanalyst and Stanvard University psychology professor, Dr. Don Chubaleevit. While cautioning that definitive conclusions would require months, if not years, of one-on-one therapeutic analysis between himself as doctor and Gov. 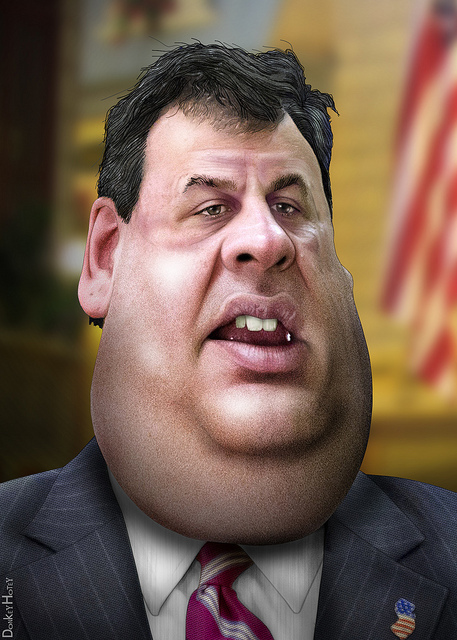 Christie as patient, nevertheless, Chubaleevit–a specialist in political personas who penned the bestselling treatise, “Because They’re Nuts! The Reason People Seek Political Office”–says he’s seen and heard enough of New Jersey’s head of state to arrive at what he termed “a guess–but a highly educated one” for explaining Christie’s frequent boorishness. And what might that simpler explanation be? Taking the temperature of ten pounds of s**t in a five pound bag is pointless.